I was never much of a pink person growing up. Even now, I tend to wear moodier shades like blues, black, brown, gray...but everyone once in a while the perfect pink item comes along and I can't resist getting my hands on it. That's how I felt about this coat. I looked at it online probably 10 times before deciding to order it & I'm super glad I did. Shades of pink have become so popular recently and have seamlessly transitioned into fall by simply changing what you pair it with. I styled my pink coat with casual black pieces, not only to let it stand out, but also to help pull the look into fall territory. Pink Accessories - For just a little pop of pink, a sweet pink scarf or gloves are perfect when paired with a neutral coat. I am also obsessed with these pink heels and already have a few holiday outfits in mind that would look great with these - hello LBD! A Pink Sweater - On the hunt for the perfect sweater? Why not try a blush pink style? I think these girly sweaters are not only feminine but also super chic. I would pair this one with leather pants or distressed jeans. A Pink Coat - The most statement making piece of the three: a pink coat, which is sure to turn heads on the streets (in a good way!). In the fall & winter in NY, outerwear is the first thing people see so I love a coat that's unexpected and fun - this pink wrap style fits the bill. I also love this feminine twist on an anorak and this furry topper. Love the draping on this coat. It's such a fun street style pairing with your ripped jeans and tennis shoes. I didn't want to take this look too girly since I thought the color of the coat was ladylike enough! I'm with you, I don't often wear pink, but when I find a piece I love it's suddenly my favourite item! That coat is seriously gorgeous! I love the way it falls. I do have a soft spot for pink! It's such a fun colour to wear. Love this coat! It's really bold. It sure is! My favorite shade right now is a light blush color. I'M in love with the coat Michelle, and it fits you so well. Love this coat! It reminds me of the Vince one that is out right now. With the distressed denim and Adidas, you are rocking it! Ugh - that one is totally on my wish list...the price kills me though! What a great coat! And I looove the color. It clearly looks great dressed up or dressed down - so cute! I agree - it will look great dressed up! Love the style of this coat! You created a fantastic outfit by combining it with jeans and sneakers. Thank you! I love statement outerwear but wanted to keep the look casual for the weekend. This coat is to die for! So in love! I love your pink coat. I'm so happy that pink is now a fall color. I love the way you styled this coat with the ripped jeans and sneakers. You look great! I'm gonna go on record and say that all colors should work all year round! This shade is too pretty to reserve for spring/summer! Pink has definitely been having its moment this season, and, while I'm not much of a pink girl myself, I think I'm falling in love with it Your pink coat is gorgeous, Michelle! 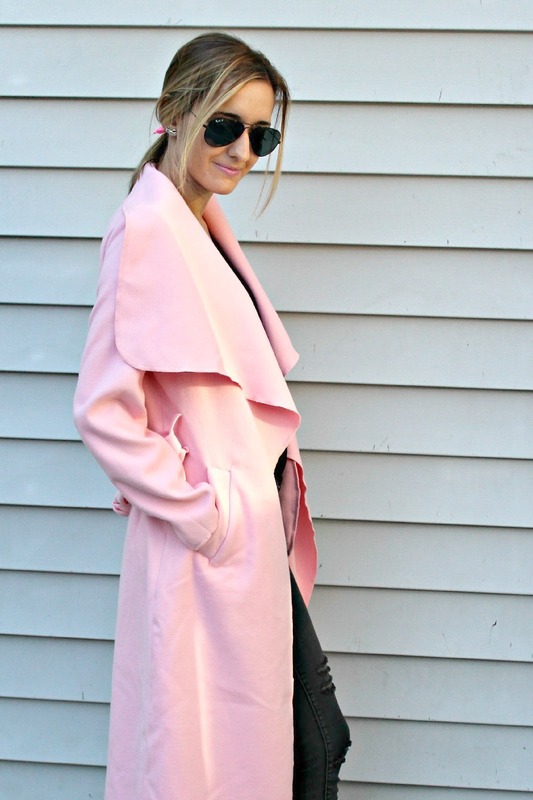 I'm with ya, I don't wear pink often, but this coat was a show stopper and I had to have it! Love that coat and the way you styled it. It is such a pretty shade of pink. love the long length on your coat! awesome look! I love the length of that coat and the draping is perfect! Looks amazing against the black top and jeans! Cute outfit! Loving the color of that coat! Pretty in pink, lady! Love the tougher touch with the ripped jeans! I'm not much a pink person either, but I want you to send me that coat right away! I know right?! It's totally stunning! I love the girl pink coat mixed with edgy black pieces. So cute! You look great in this pink coat. So beautiful coat! Adorable color! i like your coat, nice color. You have been killing it with coats this week. I love love love this one. The shape, length and soft pink color are stunning. I own a mid-length peacoat in that shade. I also love the anorak you linked up. This sporty look today is something I want to try, soon. Your Adidas shoes are great! Thank you! I love statement outerwear for fall/winter since often times its the first thing people on the street see!